However, the Rebels were unhappy with the referee at the end of the game. 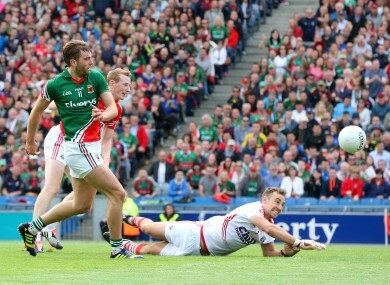 Aidan O'Shea scores his side's crucial goal. MAYO HAD ONE point to spare over Cork in a controversial All-Ireland Senior Football Championship quarter-final in Croke Park this afternoon with the win securing a semi-final tie with Kerry for the 2012 and 2013 losing finalists. In a tight first half, the sides drew level no fewer than six times with Brian Hurley (0-4) and Cillian O’Connor (0-3) top-scoring for Cork and Mayo respectively as they went into half-time level at eight points apiece. However, it was after the break the game really kicked into life. With Cork seemingly still in the dressing room, Mayo out-scored the beaten Munster finalists by eight points to one to take a 0-16 to 0-9 lead after 51 minutes. Cork, through the recently introduced Donncha O’Connor, finally sparked into life. After the Ballydesmond forward slotted over three points on the spin he levelled the game up when he smashed home the Rebels’ first goal on 63 minutes. Mayo, to their credit, responded admirably and after O’Connor pointed their first score in 12 minutes, Aidan O’Shea showed remarkable composure before rounding Ken O’Halloran to 1-17 to 1-13 with four minutes remaining. Cork were far from done though and Brian Hurley scored their second goal moments later to reduce the deficit to just a single point again. However, Mayo kicked on once more and points from Donal Vaughan and Lee Keggan left Cork needing goals as the game entered injury time. However, despite having two close range frees, Colm O’Neill opted to take points on both occasions – the second after appearing to consult with referee Cormac Reilly – before the final whistle sounded to give Mayo the narrowest of wins. After the game, several Cork players and officials surrounded Reilly as he left the pitch. Scorers for Cork: Brian Hurley 1-4 (0-1f), Donncha O’Connor 1-3 (0-2f), Colm O’Neill 0-5 (0-3f), Fintan Goold 0-2, Aidan Walsh (0-1f) 0-1. Subs: 22. Enda Varley (Garrymore) for Moran (46), 18. Brendan Harrison (Aghamore) for Barrett (57), 23. Alan Freeman (Aghamore) for O’Connor (65), 21. Jason Gibbons (Ballintubber) for Aidan O’Shea (70). Subs: 26. Donncha O’Connor (Ballydesmond) for Collins (49), 25. John O’Rourke (Carbery Rangers) for Brian O’Driscoll (55), 22. Daniel Goulding (Eire Og) for Maguire (60), 23. John Hayes (Carbery Rangers) for Walsh (70). Email “Mayo beat Cork by the narrowest of margins to book All-Ireland SFC semi-final place”. Feedback on “Mayo beat Cork by the narrowest of margins to book All-Ireland SFC semi-final place”.